There has been a recent buzz within the Angular community ever since the Angular Elements revelation at the AngularMix conference. When Angular Elements was released with Angular 6, the team at GrapeCity decided to test our Wijmo’s Angular Components to see if they are up for a challenge. Angular Elements are Angular components packaged as custom elements. Custom elements are part of the web components standard that allows an extension of the scope of Angular code, so it can be used outside the context of an Angular application. We'll be creating custom elements using Wijmos’ Angular Interop Controls by utilizing the Angular Elements project. Wijmo’s FlexGrid is a good candidate for this purpose where we'll reveal several FlexGrid attributes and related components. A practical FlexGrid implementation should include: column definitions, sorting, and filtering capabilities. The sorting feature comes out of the box with the FlexGrid implementation, so defining the FlexGrid grid as a custom element should suffice. As for column definitions and the filter feature, this requires implementing them as custom components. Let's create the web component for FlexGrid by first defining the custom elements for FlexGrid. Import the OnInit, Component, forwardRef, classes from Angular Core Module. Import WjFlexGrid, wjFlexGridMeta classes from wijmo.angular2.grid module. This is mandatory, as we need to use FlexGrid from Wijmo Angular Interop. Define the Component for FlexGrid using @ Component. The selector defined here will be used as the Custom Component. Inside the WjSampleGridComponent Class we can customize FlexGrid’s attribute. HTML attributes support only string value type; therefore, to add support for Boolean and number values type via attributes we need to explicitly convert string values into Boolean and Number respectively. This can be done by overriding the setInputValue method of ngElementStrategy. The concept of creating custom elements for FlexGrid columns is similar to the FlexGrid component (that we created in the last step). Since we need to define columns for the FlexGrid, we'll create a custom element for a FlexGrid column. We have customized some additional Boolean properties for FlexGrid Column. The property list is defined inside the boolProps variable. Now we need to register these three components in declarations and entryComponents arrays of the AppModule. As part of registering, the createCustomElement() method of @angular/elements package creates and returns a class that encapsulates the functionality of the Angular component. Next step is to register the custom element with the browser using customElement.define() method where customElement is part of global CustomElementRegistry API. We can now use the Wijmo components that we created in any HTML file of the project like we use Native HTML controls. This gets rids of any dependency on the Angular Framework. We have added the custom elements wj-grid, wj-grid-column and wj-grid-filter filter to the HTML page. 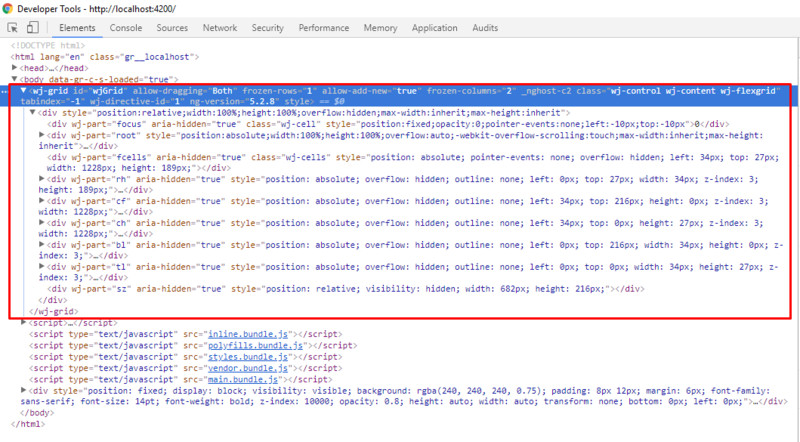 The following image shows how the code for the HTML page that we created with custom elements renders on the browser. The grid consists of columns that we defined and includes the filter feature to allow filtering of columns. Observe that the HTML code, Angular components that we created as custom components and wj-grid’, wj-grid-filter and wj-grid-column have been rendered as custom components on the HTML page. The interesting part is that the HTML page doesn’t contain an Angular root module, while the custom elements have been created using Angular. Download a Sample Angular Elements-Wijmo project! Abhishek Dutta likes how GrapeCity doesn't define his boundaries, always teaching him to strive toward overcoming professional and technical challenges. 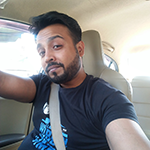 Abhishek earned a master's and bachelor's degree in Computer Application from Guru Gobind Singh University in Delhi, India, before starting his career in the software industry. In his free time, Abhishek enjoys playing games on his PlayStation 4, writing, and travelling for adventure.